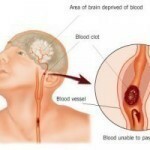 “A stroke or ‘brain attack’ occurs when a blood clot blocks an artery (a blood vessel that carries blood from the heart to the body) or a blood vessel (a tube through which the blood moves through the body) breaks, interrupting blood flow to an area of the brain” this results in brain damage. 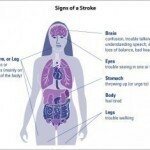 A stroke is the third leading cause of death. The part of the brain that becomes damaged will lose its ability to carry out normal functions such as speech, movement and memory. The degree of a stroke determines how much functionality a person may lose and whether the loss is temporary or permanent. Risk factors of a stroke are usually categorized as controllable or uncontrollable, that is lifestyle as opposed to medical. High blood pressure or Hypertension occurs when the heart has to work harder to circulate blood throughout the body. When this occurs damage may occur to certain organs such as the brain and heart. It will also weaken blood vessels; high blood pressure may lead to a stroke if the elevated blood pressure is not brought down to normalcy. “Cholesterol is defined as a soft, waxy substance (lipid) present in all parts of the body including the nervous system, skin, muscles, liver, intestines, and heart.” The body uses cholesterol to form cell membranes. If cholesterol builds up in the arteries it will block the normal blood flow to the brain and cause a stroke. 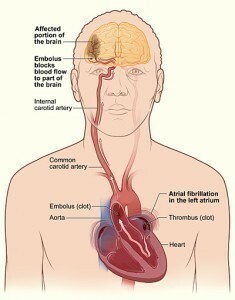 Atrial fibrillation (AF) is a major risk factor for stroke and is found in 15% of those persons that have had a stroke. AF is a type of irregular heartbeat caused by the rapid and unpredictable beating of its upper chambers. 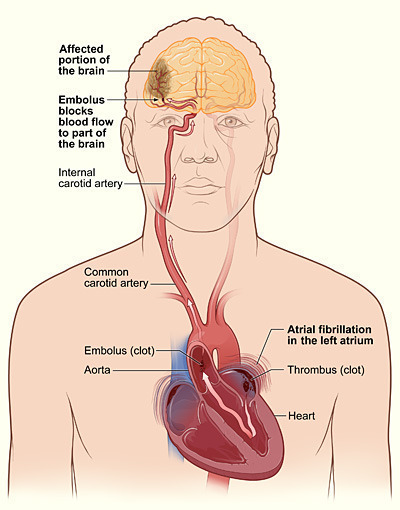 Persons with AF are more likely to have a stroke than persons without the condition because it causes pooling of the blood found in the heart. This pooling will become blood clots which can be carried to the brain resulting in a stroke. Diabetics are susceptible to strokes because a high percentage of them are also inflicted with hypertension, high cholesterol, heart attack and atrial fibrillation among other complications. Anyone or combination of these conditions in a diabetic can make the person prone to suffering a stroke. Persons will suffer severe brain damage when they have very high blood sugars. Smoking increases the risk of stroke two times in smokers as opposed to non-smokers. Smoking causes the heart to pump blood at a faster rate than normal because oxygen in the blood is reduced. As such blood clots will form. Smoking also adds to the plaque in the arteries, and if there is too much build up the blood flow to the brain may be blocked resulting in a stroke. Other risk factors of stroke are: obesity, age, gender, race, genes, previous stroke and other medical disorders.